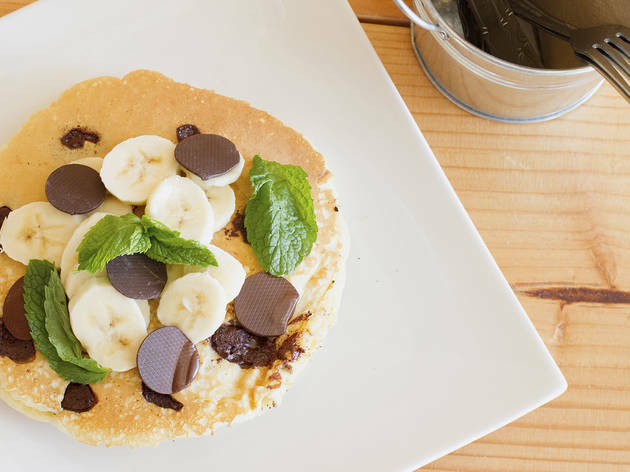 Who says Angelenos are all about egg white omelets and acai bowls for breakfast? Batter and a griddle are a terrific tag team, and LA has inventive chefs that know how to coax peak flavor from both. Come brunch time, you'll find tables sporting stacks of pancakes drowning in thick, melting pats of butter and savory maple syrup alongside cups of coffee and boozy beverages. 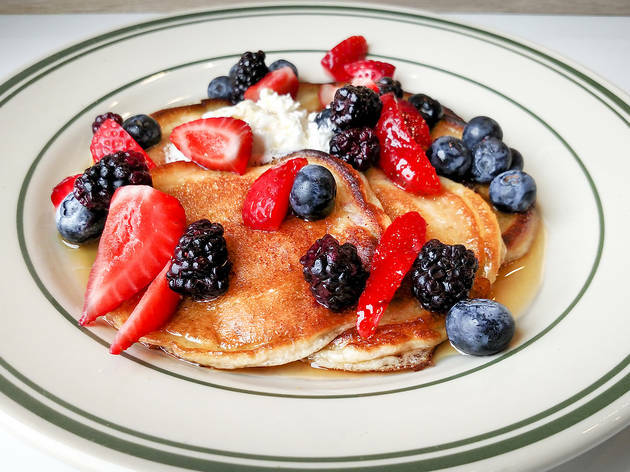 Whether they’re made with buttermilk, berries, alternative grains or indulgent ingredients, here are 9 of the city’s best pancakes—carbs be damned. Fran Camaj and chef-partner Travis Lett have created what may be the quintessential LA restaurant on Abbot Kinney, complete with reclaimed barn wood, brick floors and a knockout back patio. 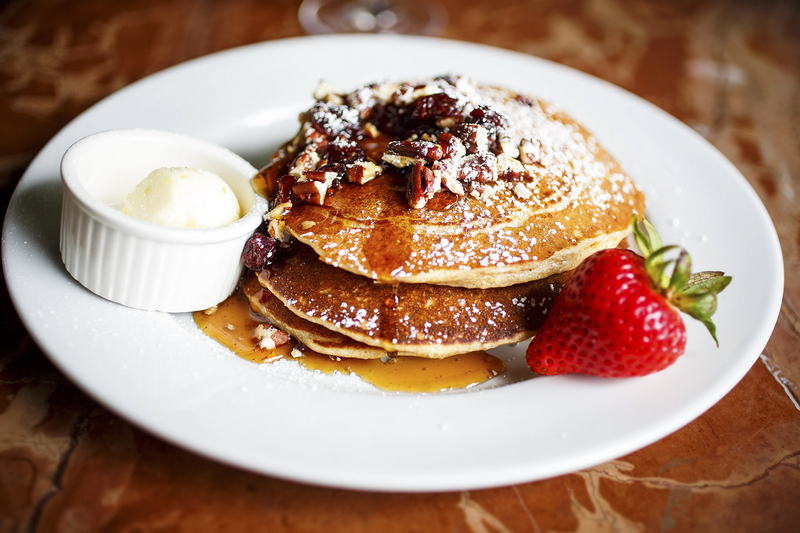 At breakfast and brunch, they feature some of the city’s most sumptuous pancakes. Gjelina’s lemon buckwheat ricotta pancakes ($13) involve three fluffy cakes folded with lemon zest and pockets of ricotta. On top, you’ll find a tangy, cooling dollop of crème fraîche, plump blueberries, sweet-tart syrup made from blueberry compote and maple syrup, and a light dusting of powdered sugar. Dig in. Chef Neal Fraser and wife/partner Amy Knoll Fraser nail breakfast at their modern Mid-City café, BLD. The eatery (who's name, in case you didn't know, stands for Breakfast Lunch Dinner) serves three meals daily to diners in a space with wood tables, an abstract tree branch and stone art feature, along with wraparound sidewalk seating. Stopping in for breakfast? 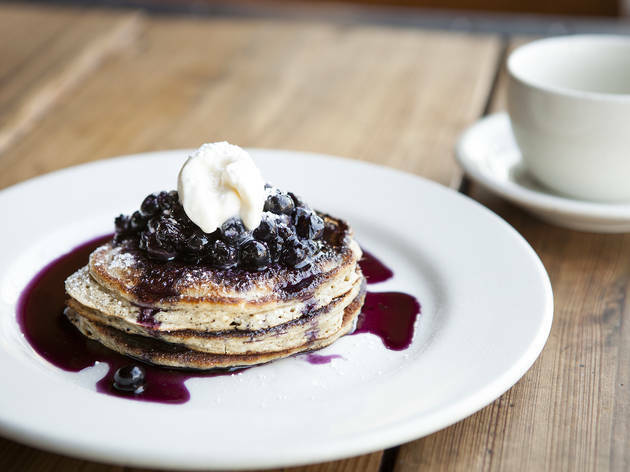 BLD's ricotta blueberry pancakes ($15) are simultaneously substantial and fluffy thanks to yeast raising and folds of fluffy cheese. The two-cake short stack comes with Berkshire maple syrup in a small log cabin container—it's so darling that it arrives without the cap, so that the cabin isn't sneaked into somebody’s purse. Jon Shook and Vinny Dotolo build on their Fairfax legacy that started with Animal by opening this popular restaurant with skylights, an open kitchen, an overflowing pastry case and Helen’s wine shop in back. 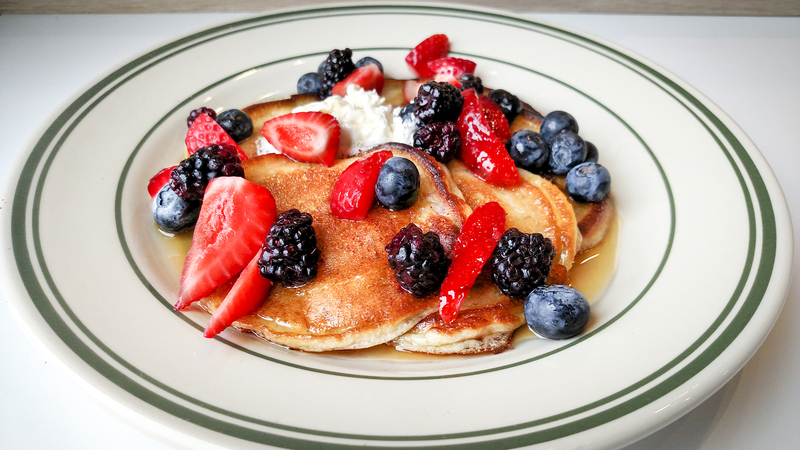 During lunch and dinner, Italian-American cuisine dominates the kitchen, but for breakfast the buttermilk pancakes ($13.25) are a coveted item. Crisped on a griddle with vegetable oil and topped with seasonal berries (blueberries, strawberries and, if you're lucky, limited edition ollalieberries), the stack is blanketed with airy salted butter and saturating maple syrup. This San Marino institution, which the late Susan Campoy opened in 1985 and daughter Julie now steers, remains one of LA's best places to grab breakfast. 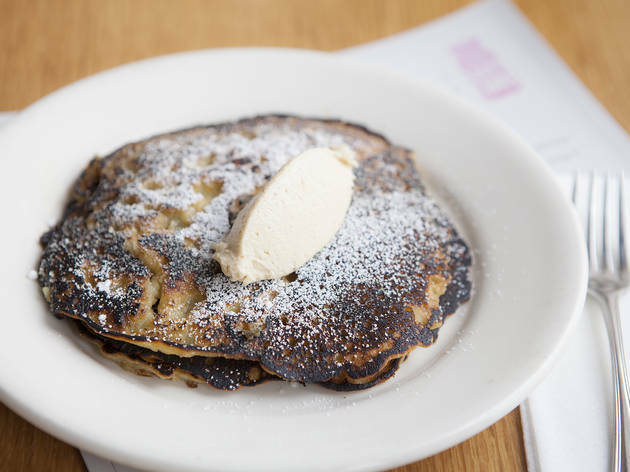 Diners gravitate towards the charming plant-lined patio with exposed rafters and fans to combat the San Gabriel Valley heat, where they can dig in to Julienne's tempting pancakes. 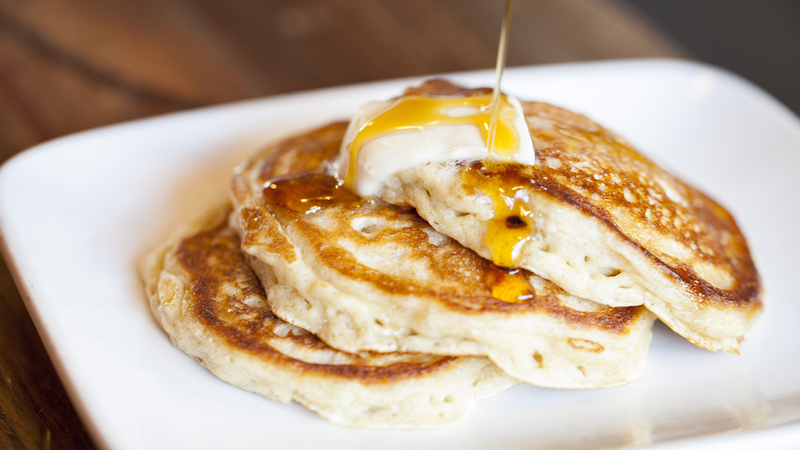 The whole grain and oat pancakes ($12.50) involve hearty whole-wheat discs created with flour, buttermilk, heavy cream, butter, brown sugar and oats. 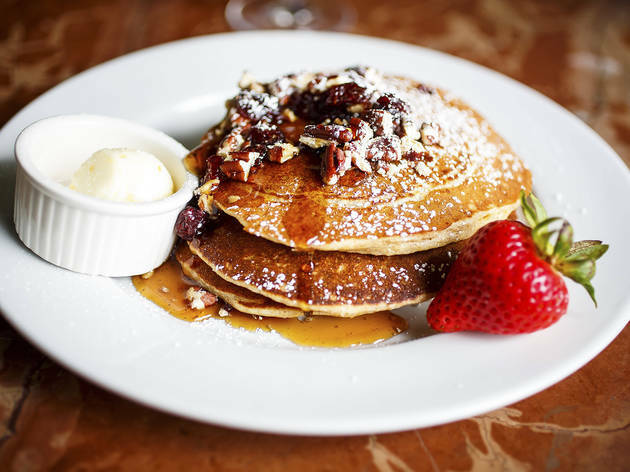 Three pancakes are topped with chopped pecans, sweet tart dried cranberry, powdered sugar and a spicy scoop of crystallized ginger butter, which melts into the cakes. Pour from a pitcher of maple syrup and have at it. Sure, Bea Chanchaisri sells sandwiches, salads and burgers at Bea Bea’s in a Burbank shopping center, but as she says, "Breakfast is everything." People flood her retro dining room, which sports a '70s color scheme of brown, orange and yellow. 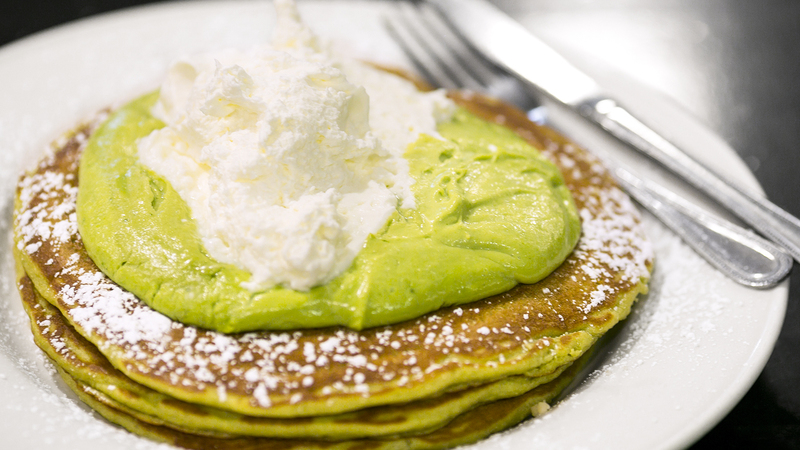 Pancakes come in outlandish flavors like Thai tea, S'mores, and Super Pumpkin, but the best move is to embrace the Green Tea Monster ($10.95). 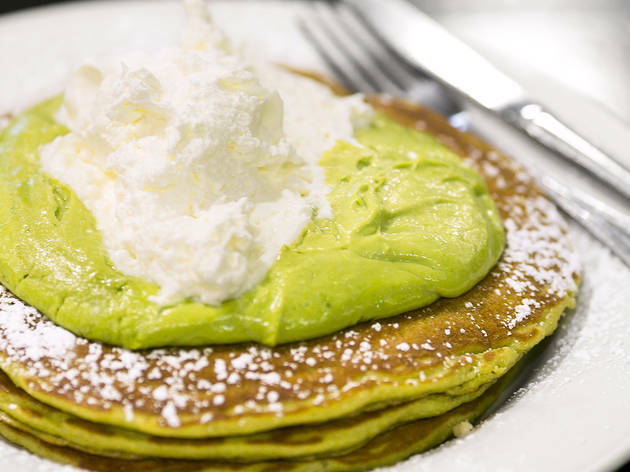 These three fluffy pancakes, which are folded with matcha powder and white chocolate, come topped with green tea mascarpone and a generous dollop of whipped cream. And yes, there’s maple syrup for good measure. Glen Ishii and business partner Caroline Shin carry on a family tradition in Little Tokyo that spans more than seven decades. Now Jist Café resides next to the East West Players theatre and features a dining room with reclaimed wood walls and a shaded, brick-walled back patio with historic stone flooring. 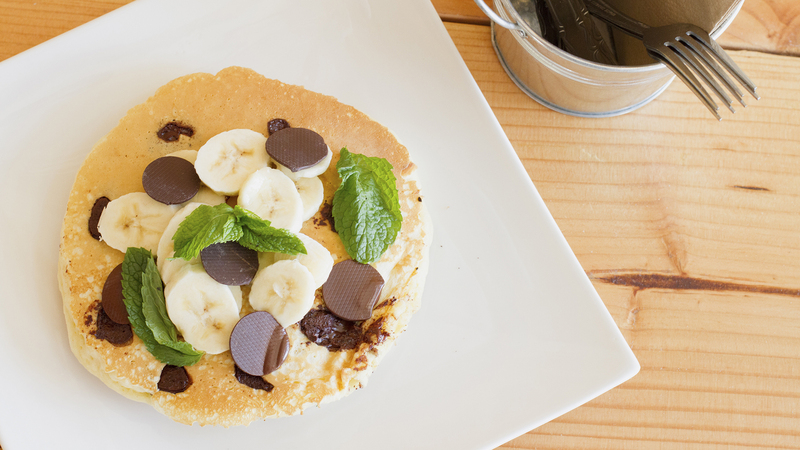 For breakfast, there are plenty of pancake options to choose from, but the TCHO chocolate chip and banana pancakes ($12) are the best. Ishii blends batter with crème fraîche to form the airy backbone, while bittersweet chocolate coins from TCHO (a Berkeley-based chocolate company) join sliced bananas and house-made whipped cream atop three cakes. Chris Phelps and Zak Walters have moved their sustainable, constantly evolving culinary wonderland to a new Hollywood location. 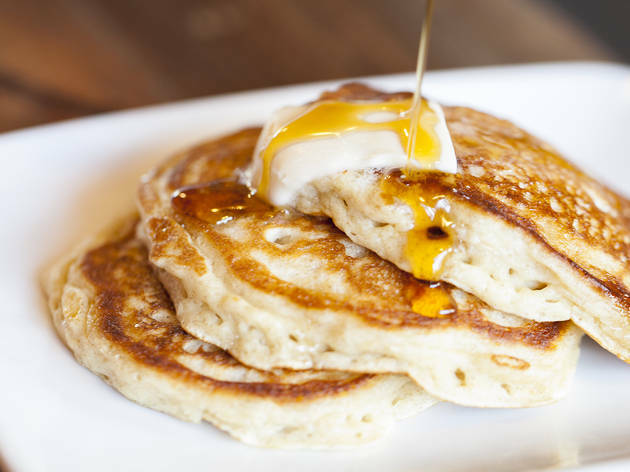 Brunch is currently only available on the weekends and changes based on what’s seasonal and available, but the Oatmeal Griddle Cakes ($10) are a constant. The stack arrives as a trio, with crispy edges still smoky from the griddle. They’re crafted with a mixture of oatmeal, butter, sugar and eggs, and come dusted with powdered sugar. 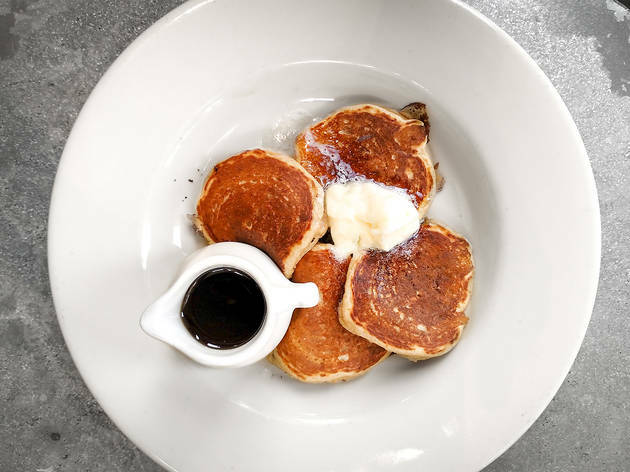 Instead of being doused with syrup, these griddle cakes come topped with a dollop of molasses butter, which melts to form a de facto syrup. 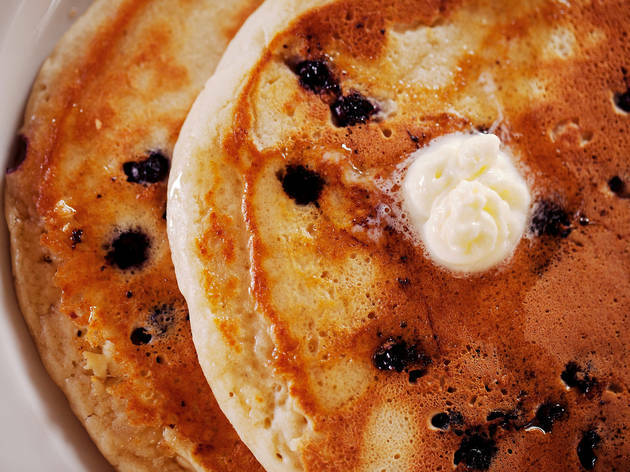 Phelps’ mom started making oatmeal griddle cakes for him starting at age two, and they’re still going strong. This La Brea cafe from chef Karen Hatfield and husband Quinn has earned a dedicated following at breakfast and lunch thanks to its seasonal California comfort food, a packed pastry counter and a fashionable space that includes brick walls, exposed wood rafters and an umbrella lined patio. 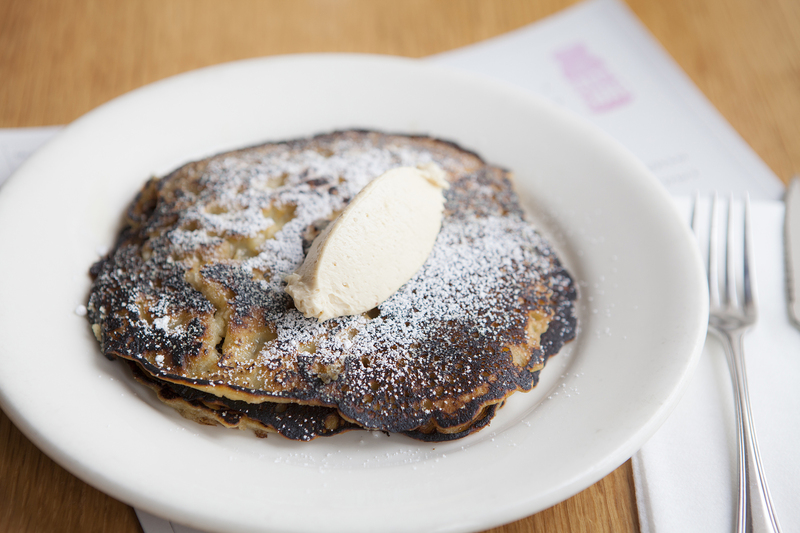 If you can make it here for breakfast or brunch, the buttermilk rye pancakes ($11) are a true breakfast treat. Each fluffy cake is created with eggs, butter, flour, baking powder, a little sugar and vanilla, salt, buttermilk and rye, and comes with salted butter and maple syrup. 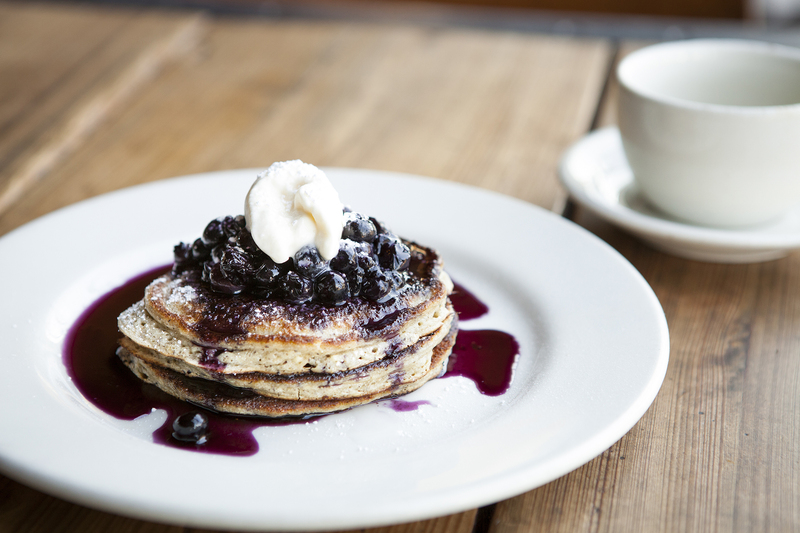 Weekday pancakes are available at The Larder at Tavern thanks to divine intervention. Chef-owner Suzanne Goin’s grandmother had a family friend who was a priest. He used to visit her Los Feliz home for breakfast, and shared his favorite pancake recipe. Goin grew up eating Priests Pancakes ($12) and now serves them in the Brentwood eatery she owns with Caroline Styne. 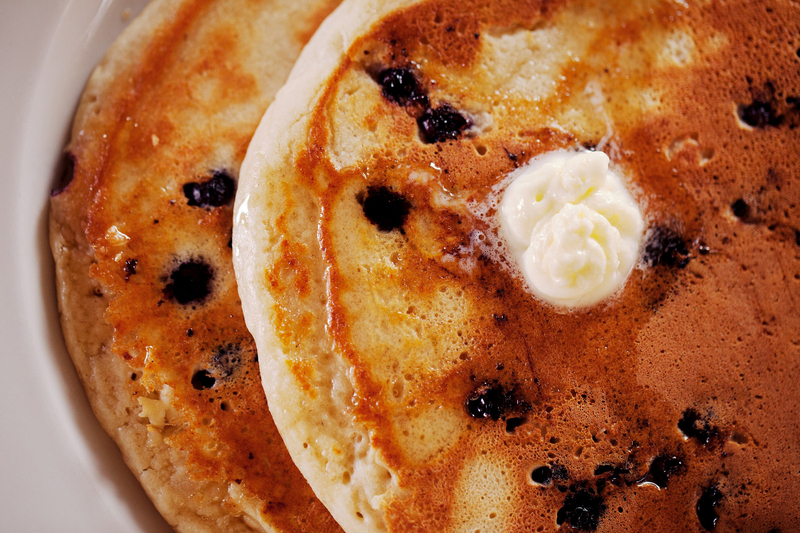 The pancakes may not look unique, but they’re exquisite. Goin melts butter and separates eggs before whipping in the whites with milk to make the cakes—five to an order— extra fluffy. 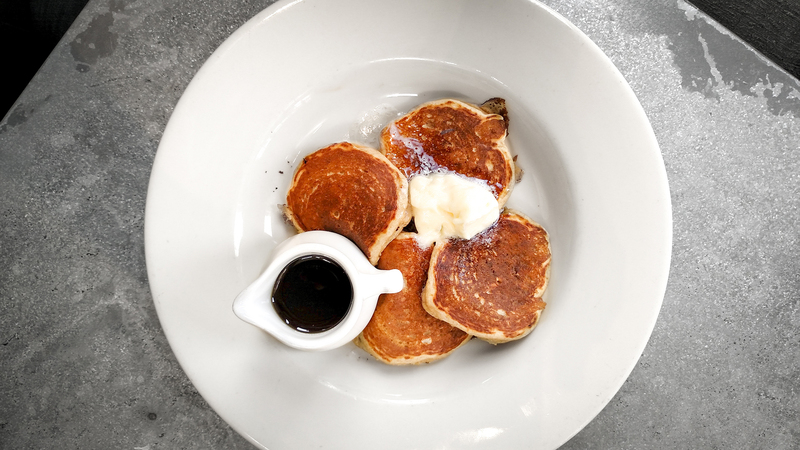 Served with a pitcher of Vermont maple syrup and soft butter, they're the perfect way to start your weekend morning—or any morning, for that matter.